These numbers are amazing. 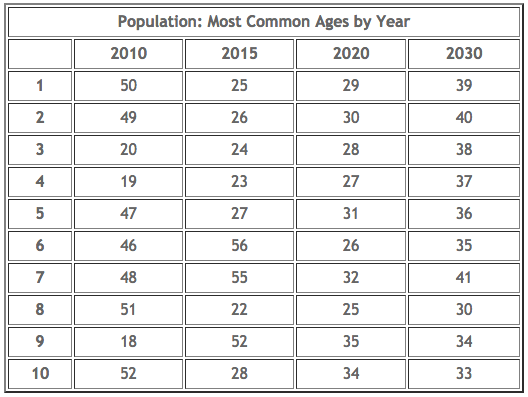 In 2020, the most common ages will all be between 25 to 35 years old. I get questions all the time from investors asking me about the impact that retiring baby boomers are going to have on the markets and the economy in the coming years. I think people underestimate the impact that the millennials — who recently overtook the boomers in numbers — will have to counteract their parent’s generation. People seem to think that millennials are all going to live in huge cities their whole lives and never buy cars or houses and settle down. My guess is that my generation is simply putting traditional next steps into adulthood off for a few more years than previous generations. In the past people used to get married right out of high school or college. Now young people go to college (many for an extra year or two), then go to live in a big city for a few years to have some fun, maybe go to grad school and by the time they decide to settle down they’re in their 30s. You move out of the mega-city to the suburbs or a more affordable city so you can actually afford a house and have a normal standard of living. You buy a house and you end up spending a ton of money on things you never would have expected to buy just a few years earlier — more furniture, decorations, tools, lawn care, property taxes, maintenance, stainless steel appliances, remodeling, countertops, cabinets and the list could go on forever. You can basically add $20,000-$30,000 to the estimated amount you think you’ll pay for a house $5,000-$10,000 to every estimate for renovations to your house. And houses these days are bigger and nicer than ever before. Then you have kids and kids are not cheap. That means spending money on diapers, car seats, strollers, clothes, toys, daycare (basically a second monthly mortgage payment), classes, sports, camps, parties, etc. The latest estimates peg the amount to raise a child to age 18 at anywhere from $176,000 to $407,000. Maybe you end up spending a little less on yourself, but you have to expect to spend more money when you have children. With kids come SUVs or minivans because you’re going to need a new car or two to carry all of that stuff that you’ve been buying for your kids everywhere. Good luck taking an Uber when you have to fill your trunk with baby supplies and use car seats for every trip you make out of the house. Growing up is expensive. It’s like a rite of passage to spend money on these things. Not every millennial will take this traditional route, but more will do so than most people now assume. As people get older they want different things. You can’t act or live like a 20 year old forever. Yes there will be baby boomers retiring like crazy in the coming years. Economic growth will likely be muted during the transitional phase that sees higher earning boomers retiring to hand off jobs to the next generation. But that doesn’t mean growth is a thing of the past. In the coming decades millennials are going to hit their peak earning years. They’re also going to be saving for retirement and 529 college plans for their kids. Some people will claim that millennials won’t have enough money because they all have huge student loan debts. In that case, grandma and grandpa baby boomer will probably have to pick up the tab on a house or car down payment or two (it’s the least they could do for almost taking down the entire financial system in 2008). I think people also forget that boomers will have two to three decades of spending in retirement, as well. If demographics are destiny in the markets and the economy then it definitely makes sense to pay attention to the baby boomers as they hit retirement age. But don’t forget that the millennials are coming to pick up some of the slack. The 2020s could be an interesting decade in terms of housing demand and spending from the new biggest generation.